“The combination of the promise of high returns, easy-to-trade digital platforms, in an environment of historical low interest rates has created an offer that appeals to retail investors. However, the inherent complexity of the products and their excessive leverage – in the case of CFDs – has resulted in significant losses for retail investors”, ESMA said. Based on the regulations of ESMA, IQ Option has distinguished the traders on the basis of their trading accounts. To solve the problem of determining whether a potential client is a retail trader or a professional trader, IQ Option is offering two types of trading accounts—Retail Trading Account and Professional Trading Account for the European CFD traders. In case of Binary Options trading, the retail investors will not be able to have any access to the trading platform due to the newly implemented ESMA regulations. Apart from these two accounts, the traders (retail or professional) will have unlimited access to the practice or demo account. There is also a VIP trading account that have some extra facilities like Personal Account Managers while the minimum deposit is $3000. But due to the ESMA-Restrictions VIP-Accounts are available for non-EU Citizens only. EU Retail Client Trading Account: The traders who do not fall under the Professional or Eligible Counterparty category can be put under the retail category. The retail clients will be most affected by the ESMA regulations. As of now, they are banned from trading Binary and Digital Options. But they still will be able to access Forex pairs, stocks, cryptocurrency, commodities and ETFs. In case of the CFDs (Contracts for Differences), the retail investors will strictly have to follow the regulations and IQ Option will also offer less leverage (up to x30). The leverage may vary as it depends upon market situations and many other factors. The positive side is that the retail investors will be covered under the ICF (Investor Compensation Fund). EU Professional Client Trading Account: The experienced traders that can properly access the risks taken and make own investment decisions will fall under this category. The trader must be authorised by a Member State under a European Community Directive, a Member State without any such reference, or a non-Member State. Or the trader must have over EUR 20,000,000 on the balance sheet, EUR 2,000,000 own funds, EUR 40,000,000 net turnover. Institutional investors from Central Banks, national and regional governments, international and supranational institutions will also fall under this category. The professional traders will continue to enjoy negative balance protection. They will have access to all the trade types that the retail investors have access to and more- Binary Options and Digital Options. The leverage is also higher, up to x500. (Terms and Conditions apply) The professional traders are eligible to participate in the tournaments. However, only the Elective Professional Clients will be eligible for the Investor Compensation Fund with the exception that their funds will not be covered. Commodity and commodity derivatives dealers. 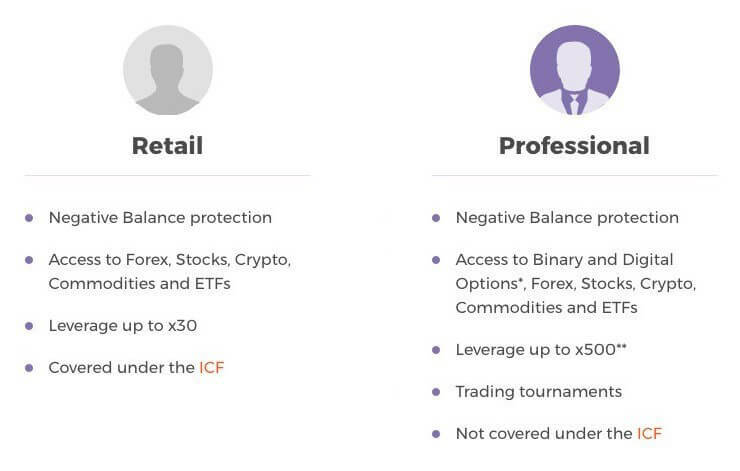 IQ Option is flexible enough to allow the retail investors to convert into professional traders, and the professional to retail at any time for them to enjoy the benefits they want to. However, the retail traders are advised to gain considerable experience in trading before switching to the professional client trading account. Out of the following three criteria the retail investor must fulfil two of them to become a professional client. The retail investor’s portfolio should show transactions over 150 EUR on Forex/CFDs or Options/Binary Options with an average frequency of 10 per quarter in the last 4 quarters, and/or the cash deposits and financial instruments must be over 500,000 EUR. Another criterion is that the retail trader should have experience of at least 1 year in a professional position that requires knowledge of transactions and services envisaged in the financial sector. Non-EU Traders are not affected by the ESMA regulation. They will have access to all IQ Option features and instruments as well as leverage up to 500.